Moments captured like these are ones I'm going to ache to go back to. I know I'll reminisce of these days when life seems so simple. A content baby playing with an empty water bottle, babbling away and only knows one word that she loves to say over, and over - "dada." Hazel is 7 1/2 months old now. She's been crawling for well over a month, she can pull herself up onto almost anything, but mostly only does onto my knees when I'm sitting on the floor, or our tv cabinet where the dvd player is, she loves that thing. She has a forehead covered in bruises right now because she had a few good bumps and tumbles these last couple of days. She just sat in the stroller like a big girl today, and absolutely loved it. I think walks are going to be more fun for her. She's more content playing on her own, so I'm starting to cook more and feel a bit more on top of things around the house. December was crazy, as always, and Dan worked a lot, so we're spending more time feeling like we have a bit of routine going on which is nice. Lindsay and I spent a few days in Victoria earlier this week which was such a treat. We wanted a little escape to get some fresh ideas and inspiration for T&T. We spent a lot of time just relaxing in our cozy hotel room, ordered room service and Hazel played in the bath for quite a while! I love that she loves the bath now, it's becoming one of my favourite parts of the day. Oh my little babushka, I love you so. We got to spend last weekend up in Whistler, which was such a treat! It was freezing, but the air and sky was clear, and crisp. It ended up snowing the day after we left! A bit bummed we missed that but hoping we get some down here soon. My dad and I drove up on Saturday and spent the day wandering around the village, and watching documentaries in the hotel with some take out pizza and wine. It was really nice to just get out of the city and away from home and just spend time somewhere else, even when you're not really doing much, it's really refreshing. Dan and Lindsay drove up later that night and we all spent the rest of the weekend there! I love mornings with this kid, she's getting huge, is insanely smiley, only laughs when you talk in a very strange voice or swing her around quite intensely. She's just the best. I could just stare out at this view for hours, and I pretty much did, the beautiful cotton candy morning sky and frost covering everything, so magical! Last week Dan and I took a little trip to Halfmoon Bay on the Sunshine Coast! A long awaited holiday for our 5 year anniversary we've been looking forward to for months. We hopped on the ferry on Tuesday afternoon and were off on a much needed get away. Since mom passed away on August 6 we were living at my dad's house for a few weeks. It was such a special time of all the kids and grandkids being under one roof. So many family meals together and good time spent, it was really special. We only had one night home and were off again. Hazel has been such a trooper through it all, adjusting so well to the weird sleeping situations and naps on hospital couches. We were both so excited to get away and have a few days before settling back into "normal" life without mom. A new normal. We got there Tuesday evening, and spent the night watching friends with some take out pizza. It was nice, we went down to the water before bed and splashed our hands through the water and saw the magical luminesence light up the water, something I've always wanted to see! We slept in 'til 11 and went on a nice long walk, got ice cream, swam, and bought some local prawns to cook up for dinner. We had a bit of a scare on Wednesday night. Dan started to cook up dinner and I nursed Hazel and laid her on the bed where normally she would drift off to sleep. I noticed she was so squirmy and unsettled for a few minutes, she just wasn't calming down. I picked her up and noticed she was so hot. I could feel her little body shaking like she was shivering pretty intensely. I called Dan over to see if it was just me overreacting, because almost instantly my heart started beating so fast. I think if we were home i would feel a little more at ease. But knowing we were in a small town, far from anyone I started to panic. It's crazy how being in the thick of hard experiences with death and sickness over the last 8 months, especially in the last two months my head just instantly goes to the worst place. We looked at each other and knew something was wrong. I tried to get some tylenol down her and we called the nurses hotline to see what we should do. They told us to take her to emergency as fast as we could. We were so shaken up. Two weeks earlier we had gotten a call in the middle of the night that it was time, mom wouldn't last too much longer. In a similar panicked state we gathered our things as quickly as possible and got in the car. I knew Hazel would be ok, but our our hearts and emotions were in such a fragile state that the smallest thing could throw us off. We booked it to Sechelt which was about 20 minutes away. I sat in the backseat singing and trying to keep Hazel calm, she was moaning and whimpering, it felt like forever. They got her in so quickly and then came the poking, blood test in the foot, the arm, can't find a vein, poke poke poke. Try the other arm, take her blood pressure, it was so hard to watch. She screamed, we tried to comfort her, we were all so tired. Finally by about midnight they figured it out and ordered the antibiotics. More needles and the loudest screams, we finally left by 3:30am and both felt wacked. 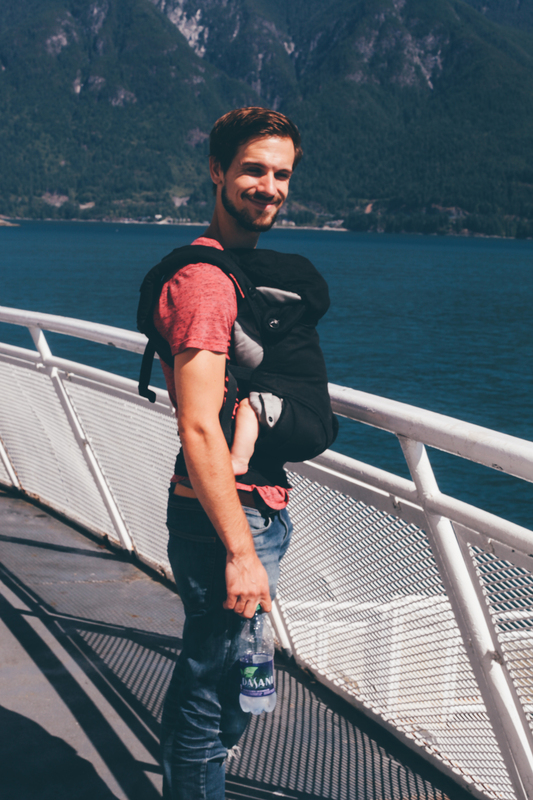 We had to catch an early ferry because they wanted her admitted into Lions Gate in Vancouver for at least a day to monitor her because she's so young. We got to our place and packed up all our stuff and tried to get some sleep. Her fever came back and she started doing the same sort of moaning thing again. We got tylenol down her and by now we both realized the sandwiches we ate at the hospital weren't sitting well. Perfect. Icing on the cake. Dan was up for pretty much the next two hours on the toilet. It didn't hit me as bad because I only ate half, and we've learned his stomach is a loooot weaker than mine. We were up at 8 to head to the ferry and off to another hospital. Thankfully Thursday was a lot more uneventful. A long day in the hospital, a lot of waiting, and more shots. It's been a long week of antibiotics I have to force down poor Hazel's throat every 6 hours. I'm beyond thankful for a healthy and much happier baby. I'm excited that the weather is cooling down and we're coming into a new season. This Summer has been so bittersweet. The highest highs with welcoming little Hazel so perfectly into our lives. and the lows of losing my mama. oh mama, you're so missed.